Elsir Vale is a quaint little rural setting that has wilderness on all borders, but maintains trade with distant realms. The vale is considered a point of light and the only surviving collection of towns from the Kingdom of Rhestilor, that fell almost 200 years ago. The Elsir Vale was introduced in the Wizards of the Coast module "Red Hand of Doom" and our old 4E campaign followed the rise of the Red Hand …(with the hope of following that at a later date with the "Scales of War" Adventure Path from wizards.com/dnd). In time, I may change the name of this setting to encompass the many surrounding areas I have developed for background, but for now it is named after the central location of the story. The following points describe some of the major details and events of the region collectively known as The Eastern Realms. 1. Tiamat and Bahamut have both been defeated. The deities of the 'Dawn War Pantheon' (as presented in 4E D&D) are central to this setting. The campaign begins following the Fall of Bahamut. Bahamut & Tiamat have waged endless war in the Astral Sea and their followers on the world have followed suit. At the end of the year 717 N.R a great comet was seen in the sky for two nights heading towards the southern horizon. Many believe this was Bahamut's body falling from the divine realm. In any case, Bahamut has not answered prayers since the sighting of the comet. This allowed Tiamat to exert her influence on the people of the Elsir Vale and in 718 N.R a great horde of goblinoids amassed and swept through the vale - only to be stopped at the Battle of Brindol. Throughout this campaign, Tiamat introduced her 'spawn' upon the world too. Fortunately, with the help of the adventurers known as The Watchers, the Red Hand Horde was beaten, as was Tiamat when her avatar came through a portal. But whilst Tiamat has simply been banished, it appears Bahamut's absence is more permanent. 2. On the World as it is in The Astral Sea. 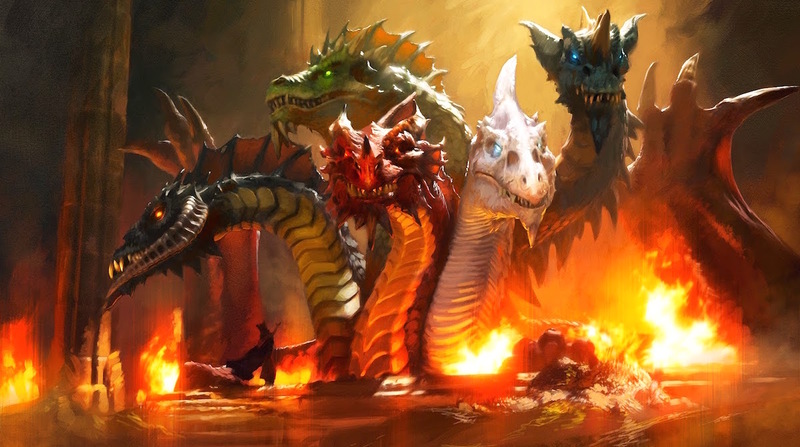 Tiamat's followers have also gained the upper hand in the mortal realm. The land of Shentulka has undergone the most dramatic transformation as a result of this. Already ruled by a purple dragon dedicated to Tiamat, now most resistance has been wiped out and templars of the Purple King seek followers of Bahamut with zeal, making it unsafe to show support for the fallen god. 3. Isolation. Whilst there are larger centers of civilisation, most are remnants of kingdoms long passed their golden eras. Larger centers cluster around independent city-states, whilst the people of the Elsir Vale remain largely unaffected by what goes on around them. They hear word from traders, but the Vale is a small rural area with wilderness separating it from all other civilised areas. There are even lands influenced by the Far Realm and the presence of a primordial, but even these have little effect on the lives of the Vale's denizens. 4. Spirits are Everywhere. Perhaps it is because many people live in isolated areas; maybe it is because the spirit-venerating Shentulka people have been long-time residents of the region. It could even be the fact a primordial is chained in a nearby prison and spirits are more open to warn people and make sure Mual-Ta remains imprisoned. Whatever the reason, spirits play a very open and important role in a lot of player character races' lives. It is not unusual to be from a tribal background and to perform small rituals to honor the spirits of the land before undertaking simple activities, such as beginning a journey, hunting, eating, etc. 5. Native Americans are in. The Shentulka People, whose traditional homelands are the lands north of the Elsir Vale, are based on Native American culture - predominantly the plains People (though those in the Vale's forest are more like the northeastern People). By no means are the Shentulka meant to be a historical take on the Native Americans, nor a cultural study of the many different peoples that made up Native American cultures. But, I have always had a love for these people and (by chance, of course, as I determine most stuff randomly) am thrilled they make up part of this setting. Their culture is also considered a 'standard' outside the civilised lands - meaning wild elves, shifters and even goblinoids live lives similar to the Shentulka. Unlike real-world Native Americans, the Shentulka are also a little Celtic; some use metal weapons, others build barrows to bury their dead, and standing stones are considered sacred sites. 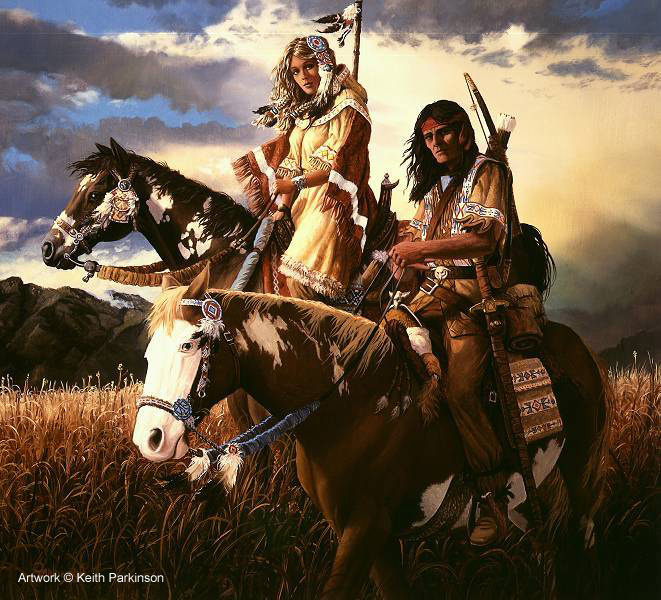 By no means do I intend to adhere strictly to the way real world Native Americans lived, but their cultures form the basis for the fantasy Shentulka. 6. Spirit Stones. More commonly called 'Life Stones' or 'Heart Stones', these ancient, huge gems of power are inextricably linked to the land. It is said each area of natural beauty only exists whilst its Heart Stone exists. They are presumably life given a physical presence by the spirits. Whilst the Life Stones remain in the natural realm they suffuse and permeate, that natural realm continues to develop. If the stone is removed, destroyed or imprisoned, such that connection to the land is prohibited, then the land degenerates and defiles over the course of decades (though this depends upon the size of the natural feature it is linked to). Rivers, mountain ranges, forests, marshes and all other large natural verdant features each have their own stone. Barren areas, such as the Sunken Lands and the Thornwaste, are examples of regions whose Life Stone has been destroyed or removed. 7. Standard Setting. Despite the few cosmetic changes and unique qualities mentioned above, the setting is still fairly standard Dungeons & Dragons where most of the core concepts and conceits hold true. Whilst some races from the core books do not exist, dwarves are in the mountains, elves are in the forests, human settlements are points of light. Goblinoids are a constant menace and giants and dragons pop up to cause trouble. There are distant realms of civilisation that are more advanced and magical, but the quaint Elsir Vale remains an isolated 'standard' area for play.